I’m from in Edmond, Oklahoma, where I live with my wife, Mariel, and our four children, who range in age from 5 months to 19 years old. When I was 18, I enlisted in the Oklahoma Army National Guard. After nine years, I took a break to focus on my family and joined the police department. 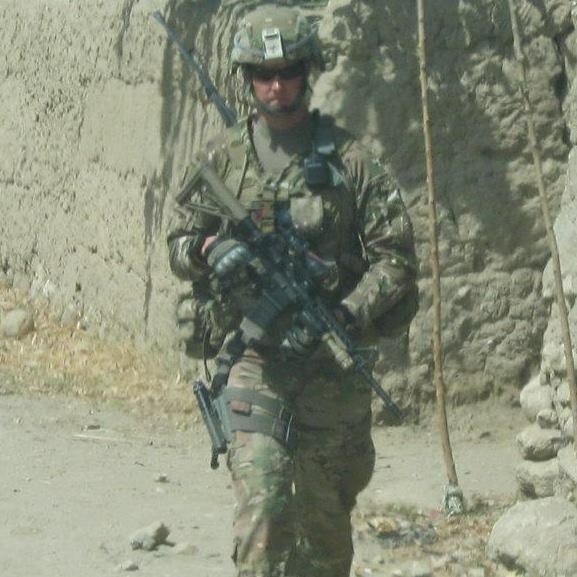 In 2008 I reenlisted and served in Afghanistan. In 2011, my patrol was hit by an improvised explosive device (IED). I spent the next seven months in a wheelchair or on crutches, and was told I may never walk again because my heel completely separated from my foot in what’s known as acalcaneus fracture. After several years of treatment, I was able to save my foot and now I can walk. It’s not as completely functional as it used to be, but it works. My convoy driver, who had the identical injury, wasn’t so lucky. He had the amputation. In 2015, I was officially medically retired from the service. I’d been doing police work again, but couldn’t do the SWAT Team job I’d done before. The department created a training position for me, and eventually I was able to go back on patrol. I got to be overweight, gaining 40 pounds. While my life’s work as a soldier and police officer had been about taking care of others, including my family, my community, and my country, I realized I had to take care of myself, too. One day I noticed a guy in my department was dropping a lot of weight. I asked him about it, and he told me his secret: Herbalife Nutrition shakes. I was the ultimate skeptic, but it helped that his wife Carmen, a nutritionist and personal trainer, gave them the thumbs-up. He brought me into a club that was owned by a retired firefighter, Lance Breeden, who would become a kind of mentor to me. Being in public service, Lance understands where I come from, and the insatiable passion for giving back to the community. The first time I walked into the nutrition club, I was a little uneasy. I felt the opposite of “top of my game,” but everyone was so friendly and welcoming to me. I wondered if it could possibly be real, but the more I spent time at the nutrition club, I saw how supportive and genuine everyone was and I knew it was exactly what I needed in my life at that time. I started using the products and working out, and was amazed to see that within a month I lost more than 20 pounds*. Today I’m at my ideal weight and I’m going to start focusing on building more muscle, and thinking about competing in a fitness or bodybuilding competition. Herbalife Nutrition is more than a selection of products. It’s the hope I received when I was at my lowest. There’s a heartbeat behind everything they do. I realized that if Herbalife Nutrition worked this well for me, I could inspire others, and so Mariel and I became interested in the business aspect. We now own three nutrition clubs in the state of Oklahoma. Yesterday, I retired from the police department and will now focus more attention to these clubs**. And what’s great is that the driver of the convoy during the IED explosion is my business partner in one of my clubs. My work with Herbalife Nutrition is an evolution of my desire to serve, to be part of something bigger than myself. There’s a culture of positivity that lifted me up when I needed it most. What I would advise anyone who feels like there’s no hope and no place to go is that your past doesn’t determine your future. You are in the perfect place; you are where you are for a reason. I was facing some new perceived limitations at the time that, if I had allowed them to hold me back or allowed them to close my eyes to the possibility or the opportunity that was in front of me, then none of this would have come about. Focus on what’s in front of you and take those opportunities that come with an open mind and an open heart.